One of our favorite art blogs, A Faithful Attempt, posted a project a few years ago for her 6th graders, and our art docent for a 3rd grade class taught it to our students. The project speaks to the wide range of ability throughout various grades! Using chalk pastels, students learn how to draw and shade snowmen being lit by the moonlight. It is a great example of color variation in the given light....cool tones with dark light, warm hues with brighter light. 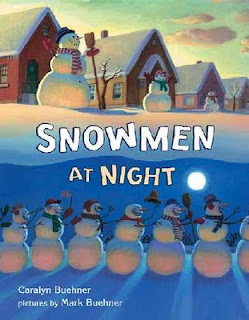 The assignment is based on a beautifully illustrated children's book by Mark Buehner, "Snowmen at Night"